Roccat Leadr Review: Another Great Wireless Gaming Mouse | Nerd Much? I’ve never been one of those PC gamers who shies away from wireless technology. I know there are those out there who think that wireless just can’t keep up with wired anything, and while that used to be the case many years ago, that’s simply no longer accurate. 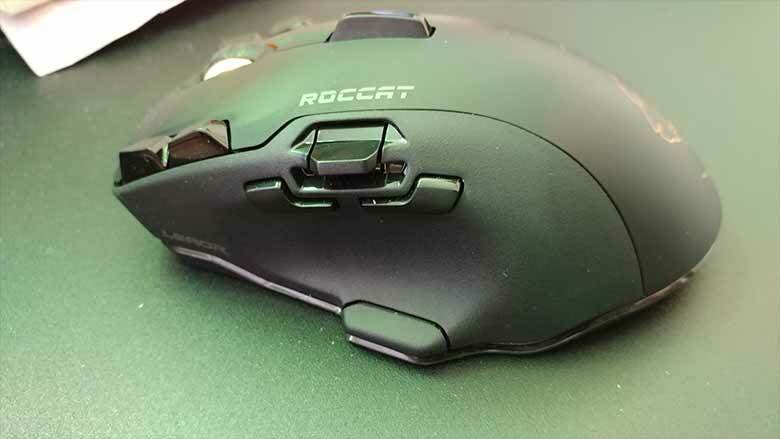 There have been plenty of great wireless headsets and a couple of great wireless gaming mice to hit the market in the past couple of years, and most recently, Roccat entered into the wireless market with the Roccat Leadr wireless gaming mouse. Luckily, we were able to get our hands on one and have been using it for the past week and a half, and we’re ready to share our thoughts. First noticeable with the Leadr is its many buttons — more than the Logitech G903 (its leading competitor). Significantly more, in fact. There are two buttons on each side of the left and right click, a scroll wheel, another button located right in the center of your grip that defaults to Tilt Left and Tilt Right, two buttons on the side of the mouse that sit right above your thumb, a scroll up/scroll down button and an Easy-Shift button. Now, if you’re wondering what the hell an Easy-Shift button is, it’s basically like having a shift key of sorts on your mouse to allow you to add up to 5 more functions for the five options on the side of the mouse. 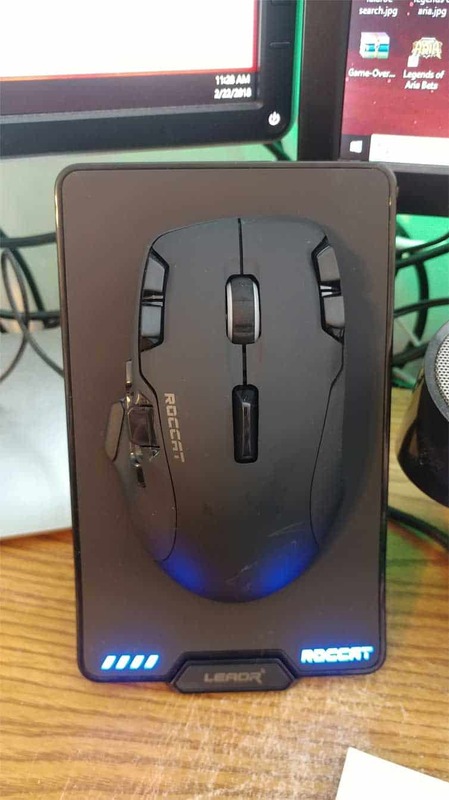 This is one of the design ideas that set the Roccat apart from its competitors, as it’s not available in any other wireless gaming mouse just yet. The second biggest difference is in the Leadr’s size; it’s notably made for larger hands. The Roccat feels about 40% larger than the G903 I’ve been using, which makes it slightly more comfortable for me (results will vary, obviously, depending on own preference). 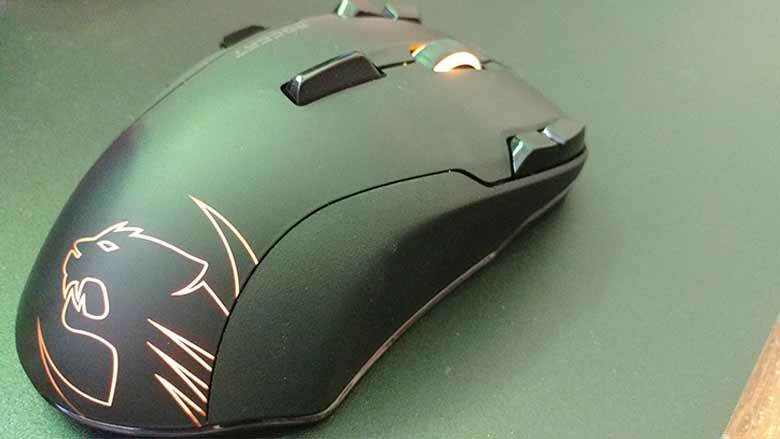 The Roccat Swarm software is also quite formidable in comparison to Logitech’s Gaming Software, and this makes the Leadr incredibly easy to customize. You can reassign buttons as you see fit, and you can easily create macros, profiles, and change the lighting. You can also change the DPI settings so that when you press the DPI up/DPI down buttons on your mouse you can get the exact interval jumps you want to achieve. The software helped make the Roccat Leadr the ideal mouse for my nightly PUBG gaming. I changed button 12 to my inventory button and 13 to change the fire mode for my weapons for quickest access. I also set my DPI to a high of 6000 for browsing use all the way down to 800, my preferred sniping setting. I also used the Leadr with World of Warcraft, setting some spam macros to different buttons on the mouse with ease using the software. As far as the battery life is concerned, it lasts for roughly 20 hours without dying on you. What I found myself doing (outside of testing, of course) was using it for two days, and then putting it on the charger overnight for that second night. That kept it charged and running the next couple of days just fine. The battery charges by setting the mouse into the large receiver, which is an upright rectangle that, although it’s bigger than we’d like it to be, it looks great, complete with LED lighting and a battery indicator for the mouse that will keep you updated with how much battery the mouse has left. Again, it has a clean, sophisticated look to it, and it fits right in among the rest of your desktop gadgets just fine. The biggest flaw I found with the Roccat Leadr is in its scroll wheel, which unlike the Logitech G903’s ability to switch to a smoother scroll, the Leadr is stuck with the clicky scroll. While that type of scroll is what you’ll likely prefer while gaming, it’s not the optimal scroll for browsing and doing other things all day on your PC. Unfortunately (fortunately? ), I’m required to be at my PC for 8 hours a day, working away at this website. This means I definitely felt the annoyance of that scroll wheel. That is, until I realized that there’s a quick scroll button near my thumb that can scroll up and down smoothly without having to feel that grinding click. And, on top of that, you can change the vertical scrolling sensitivity to your liking. It does take some getting used to, but once you get the hang of it, you’ll be okay with the change. I’ll also note one other small issue that I stated above, and that’s the size of the receiver. It’s pretty big and takes up a good amount of desk space, and it would seem unnecessarily so, as you only really need a mouse-size charger. I could easily see the receiver, itself, being shrunken about 20-30%. It’s also worth mentioning that Logitech’s G903 keeps the wireless charging entirely mindless, where with the Leadr, you’ll have to remember to pop it onto the charger every couple of days to keep using the mouse wirelessly. But other than those small caveats, the Roccat Leadr is a great wireless gaming mouse. And even though Logitech has it beat with the wireless charging pad, the Leadr is pretty much better in every other way. It has more buttons and therefore has more customizable settings, it’s slightly bigger size makes it more comfortable for daily use, and it has the added benefit of an Easy Shift button that we found ourselves using more than we thought we would. We’d be hard-pressed to have to choose between the two, but we can confidently say that the Roccat Leadr is one of the two best gaming mice currently available.